First there is Sarah. Interviewing her is like playing a great game of tennis. You serve the question and she smashes it right back with a well-crafted answer. At times your conversation is like the perfect rally. You cannot fault her game. And then there is Kate. On paper she looks great. But she is stumbling, struggling to find her feet. She is just not giving you any kind of game. You think she can do it, but she is not convincing you. So who do you choose? Sarah, I assume. But is Sarah the best candidate or just the best candidate at interviewing? Of course, there are roles that you may want to judge in an interview set up. Sales or Customer Services employees may well have to be on their top game in similar situations. But the payroll administrator or the software developer? You probably don’t need them to excel here. 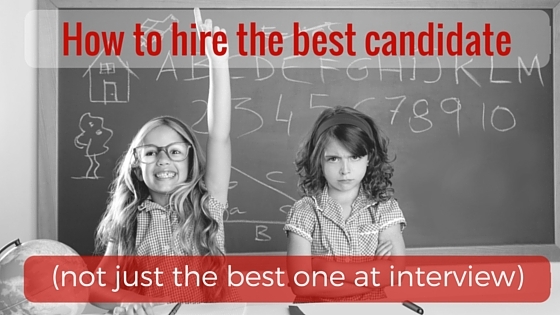 So how can you improve your chances of hiring the best candidate for the job ? 2) Find the best way for your candidates to demonstrate if they have what you are looking for. Then look at the skills they will need. But don’t just think about what you have on the job description. Think of the five things you need someone to get done in the first year. What are the best way to identify if your candidates have the behaviours and skills they need for this role? Start this off by making it part of the application process. Describe a problem they would be likely to face in their role and ask them to respond with how they would solve it in no more than 1000 words. Ron Friedman calls these job auditions. Prior to any formal interviews, successful applicants are asked to complete an activity that they would do as part of their job. This shows you what your candidates are capable of before (potentially incorrect) judgements can be made at interview. Sales Executive: Deliver a sales pitch to you – selling your product. Web designer: Design a landing page for you. Project manager: Write a project plan based on a project scope. Customer Services Manager: Analyse customer service statistics and plan out next steps. She doesn’t give them a due date. She asks them to submit the project as soon as possible to the best degree possible. She will compare work that was completed by one candidate in three days to the work completed by another in ten. (There may be 8-10 candidates in play at this stage). Her business is fast paced and she needs to get stuff out the door fast. She worries about hiring perfectionists that would find this hard. She will allow them to ask questions but makes it clear that the quantity and quality of questions will form part of the assessment. She is a not a hand holder and wants to weed out the needy ones. With Melanie, candidates could go through three to five projects BEFORE they get to the interview phase. Phew! If you have the time, and your candidate has the patience, then you will be pretty sure you have hired the right candidate. An easy way to do this is to take them for lunch with the team to see how they interact. Think about who you invite. The dynamics will be different if all the attendees are senior to them at the lunch. They may maintain a ‘false’ best behaviour in this situation. Do you see them display the behaviours you are looking for? Do they listen when people speak? How do they interact with the waiting staff? Are they interested in learning about others or just talking about themselves? Or be more creative. Grant Thornton, a management consultants, invite final candidates to a cooking class for example. What could you do? Choose something that fits your company culture to see how they will fit in. Eyes and ears when you are out of sight can be invaluable. Find ways for other team members to interact with your candidate. Tell them (but not the candidate) that you will be looking for feedback. Invite the candidate to sit with someone to see what they do. Find out what questions they asked. Varying your recruiting tactics will not just find you the best person, but the best person that is more likely to stay for the longhaul. You will see a more relevant side of your candidates. You will also give the candidates a far clearer view of what is involved in the job and what your business feels like. Worried about putting them off? If this is not the right role for them, you want them to decide now. Not in three months’ time. In addition to any of these approaches, you will obviously want to have a conversation to get to know your candidate. But make it humane. Drop the ‘bright light in eyes’ interview technique. This won’t make it any less effective but it will enable you to get to know the real person behind the resume. Making your recruitment process relevant to the role will allow you to hire the best candidate. Not just the candidate that performs the best at interview.